The classic design of this chair is sure to become a favorite addition to your living room or family room. A plump box seat cushion, tight seat back and soft, rounded arms create a cozy seat that you'll want to spend more time in. Tapered block feet add the finishing touch to this traditional styled chair. Pair with the matching sofa for a coordinating room design. The 1130 Traditional Chair with Tight Back and Block Feet by Lancer at Town and Country Furniture in the Hamburg, Buffalo, Lackawanna, Eden, NY area. Product availability may vary. Contact us for the most current availability on this product. 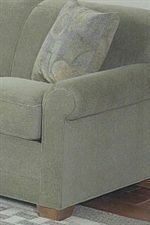 The 1130 series of upholstery offers a traditional design with its tight seat backs and block legs. 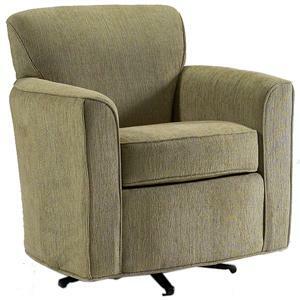 Featuring lower backs with firmer seat cushions for excellent support, this collection will be a cozy and comfortable addition to your family room or living room. With a large choice of fabrics to choose from, you are sure to find a look that fits your style. Coordinating items also available include a chair and a half, loveseat and ottoman. The 1130 collection is a great option if you are looking for Traditional furniture in the Hamburg, Buffalo, Lackawanna, Eden, NY area. Browse other items in the 1130 collection from Town and Country Furniture in the Hamburg, Buffalo, Lackawanna, Eden, NY area.